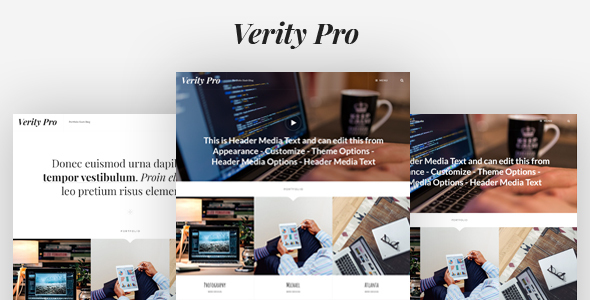 Verity Pro – Portfolio and Blog WordPress Theme is a minimalistic modern theme for bloggers and creative professionals, who are looking for a simple-yet-stylish online presence. We have sacrificed over-the-top design elements so that your website looks sleek and straightforward, allowing visitors to concentrate on the content you are offering and the value they can get from it. It comes with necessary tools and features, like Featured Content and displaying multiple portfolios, to empower webmasters of any skill level to create quality websites in a short amount of time, without having to write a line of code at any point. It is built using the latest HTML and CSS codes which ensure top-notch web security. This theme is translation ready.